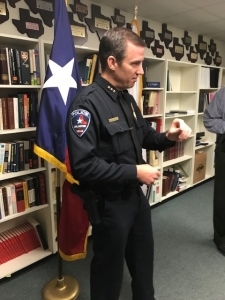 ARLINGTON (WBAP/KLIF) – The Arlington Police Department is working to improve the ways hate crimes are handled. The department hosted a training seminar and panel Thursday in coordination with the Matthew Shepard Foundation, Lawyers’ Committee For Civil Rights Under Law, Civil Rights Enforcement Associates, and the International Association of Chiefs of Police – Human and Civil Rights Committee. This class was designed for detectives and prosecutors to learn more about managing community conversations, investigating and prosecuting hate crimes. Representatives from the United States Attorney – Northern District of Texas, Tarrant County Criminal District Attorney’s Office, and other chief executives and senior federal law enforcement executives in attendance. The seminar focused on reasons for vigorous hate crimes enforcement; importance of developing strong ties between law enforcement and vulnerable communities; appropriate investigative measures that should be taken when a hate crime is reported; and other topics. The classroom instruction came from former federal prosecutors and investigators with experience investigating and prosecuting hate crimes. Copyright 2018. WBAP/KLIF News. All Rights Reserved.